Let this handcrafted bracelet be a guardian along life's camino. Apart from the chips of Red Jasper, this charm bracelet also features a discreet concha shell of Spain's Camino de Santiago . . . the famous journey otherwise known as the Way of St James. So protection and guardianship are the hallmarks of this unique and eye-catching bracelet - a wonderful Camino gift. Dimensions: The bracelet is approx 7.5" long with a 1" extension chain and fastens with a round bolt ring. Chips of Red Jasper are interspersed with silver-coated ceramic tube beads and there is a small sterling-silver scallop shell charm..
Help your friends or loved-ones feel safe by sending this eye-catching and meaningful present. Comes gift-wrapped, like all our presents - and we can print a personal message on your behalf. About RED JASPER : The so-called "Guardian gemstone". 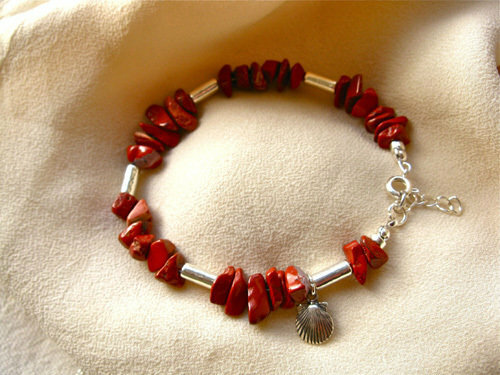 Red jasper has been thought of as a stone of protection for thousands of years. It is also said to give people the courage to stick to their beliefs, and the bravery to strive for personal independence. Some people also believe that Red Jasper can promote physical stamina. For these reasons, Red Jasper would be a suitable companion for those travelling on a journey or trip; as well as for people attending an interview, or perhaps visiting the hospital, or facing the challenges of a new activity or "first day". More information about Red Jasper . .